Mar. 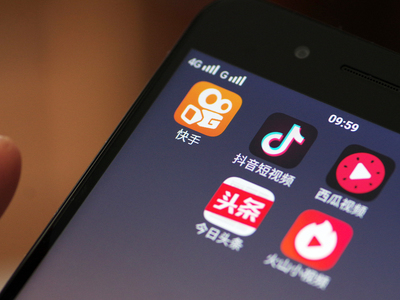 29 (NBD) – "I am too addicted to Douyin" is a common self-mockery expressed by many Chinese netizens on social media, referring to the long time they unwittingly spend on the domestic version of TikTok, as well as another popular short video app Kuaishou. Now the state is taking action to prevent part of the short video watchers—teenagers—from lapsing into binge-watching. Under the guidance of the Cyberspace Administration of China (CAC), short video platforms including Douyin, Kuaishou, and Huoshan launched trial "addiction-prevention system for teenagers" within their apps Thursday. The system will be activated when users open the apps for the first time every day, and it will guide guardians to select Kids Mode for their children. The Mode will limit the duration, period, function and content available to minors. Kuaishou sets the upper limit of daily watching time at 40 minutes, with a "curfew" from 10 p.m. to 6 a.m. of the next day. Teenagers can watch live streaming, but cannot put money in or take money out from the app, nor tip the broadcasters. Douyin has the same time control measures, but goes further to cancel live streaming for good in Kids Mode. Both apps offer "content pool" tailored for teenager users, which provides educative and positive clips. The videos selected and recommended by algorithms that Douyin's operator ByteDance is famous for are gone. Apart from the above-mentioned measures, the system will trial automatic switch to Kids Mode for left-behind children in rural areas, who are identified by geographic locations and analysis of user behaviors. Multi-million of children in China are separated from their parents who work in distant locations, therefore their education and growth is of special concern to society. The CAC will expand addiction-prevention systems to all major short video platforms in June, based on the experiences gained from the pilot projects, and plans to establish a unified industry standard. As of December 2018, the number of China's short video users has reached 648 million, and most of them are teenagers, according to a report by the China Internet Network Information Center. On average, users spend 25 to 30 minutes on Douyin and 60 to 70 minutes on Kuaishou daily, data from iResearch Consulting Group shows. Currently there is no report of obsession in short videos seriously impeding the growth of teenagers, but impulsive tipping to live broadcasters sparks concerns. Focus Report, a TV program of China Central Television, reported in 2017 that a 13-year-old boy in Henan Province spent 24,000 yuan (3,564.3 U.S. dollars) to tip broadcasters on Kuaishou. Similarly, a 9-year-old girl in Jiangxi Province spent over 10,000 yuan (1,485.1 U.S. dollars) via her mother's Alipay in tipping streamers. Tipping has become a major source of revenue for Kuaishou, bringing the company 20 billion yuan (3.0 billion U.S. dollars) last year, equal to the advertisement revenue of Douyin. The conflict between the monetization approach of an Internet platform and its social responsibility has also afflicted the gaming industry. In August 2018, a seventh-grade student fainted in an Internet Café for sitting in front of the computer too long. Later in that month, a 13-year-old boy fell from his home and died. He was obsessively playing Tencent's online game PlayerUnknown's Battlegrounds before his mysterious death, according to his family. Gaming companies were bombarded after such incidents, and Tencent has started a series of minors protection system since 2017, which significantly reduced the time teenagers spend on their games.